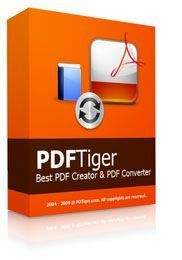 PDFTiger is a multiple functional PDF conversion software. PDFTiger is firstly a PDF creator to convert Word, Excel, PowerPoint, TXT, image file to PDF format. While PDFTiger is also a PDF convert, you can convert PDF files to MS Word Documents, RTF, TXT, Images, HTML, and Flash SWF Files. PDFTiger is now under Time-limited Giveaway Promotion, you could download and register it for FREE before Oct 21, 2010. PDFTiger is a Word To PDF Converter and PDF To Word Doc Tool that quickly and accurately create PDF documents from Word, Excel, Powerpoint, txt or Images. This entry was posted in Office & PDF, Tips & Tricks and tagged pdf, pdf converter, PDF Creator, PDF to Flash, pdf to word, PDFTiger. Bookmark the permalink.